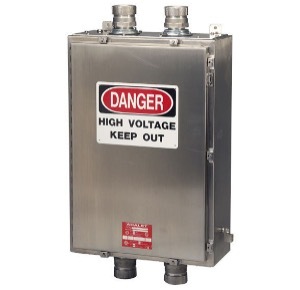 The HV4X(6) series of increased safety high voltage terminal enclosures feature a single door style with clamped cover and are available in stainless steel 316L or 304. The one in/one out connection series is designed for shielded or unshielded cables up to 8kV at 500A per phase, while the two in/two out connection series is designed for two parallel unshielded cables up to 1.1kV at 1000A per phase. The HV4X(6) series is offered in sizes from 24"x12"x6" to 60"x36"x16" for the 1 x 1 connection series and 20"x20"x8" to 60"x36"10" for the 2 x 2 connection series.